„I hate violence and we hate war, but …“ the Blaggers once sung about Northern Ireland … Sometimes the right conviction, the power of the people, courage and enthusiasm are unfortunatly not enough to resist the brutality of this world. It’s definitively not the lack of all this what makes Free Kobané in kurdish Rojava a highly endangered place since weeks. 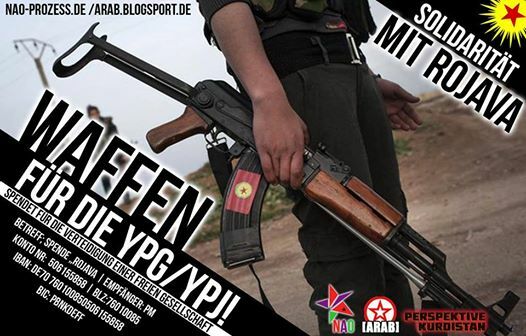 That’s why we support the campaign to collect money for weapons for our comrades fighting in the rows of YPG and YPJ against the clerical fascist IS and for liberty, equality and peace in the Middle East. BIJI AZADI !